These blooms may look as delicate and lovely as a spray of garden roses, but their beauty is not nearly so fleeting. Each blossom, made from hundreds of tiny, glittering beads of colored glass, will last a lifetime, if not centuries. The craft of making Venetian-glass beaded flowers originated in the late 1400s and experienced a resurgence in the mid-nineteenth century. The blooms shown here, however, are hardly old-fashioned. Alanna Jacobs, an associate art director at Martha Stewart Living, improvised a technique for making exquisite jewel-like blooms and beaded a bouquet of flowers for her wedding. Alanna loves creating things with her hands, so she relished the months of slow and steady beading that went into crafting an entire bouquet, and found the process to be very meditative. The result was a brilliant and bold cluster of flowers even more vibrant than those found in nature. Inspired by Alanna's ingenuity, we developed our own assortment of beaded flowers. 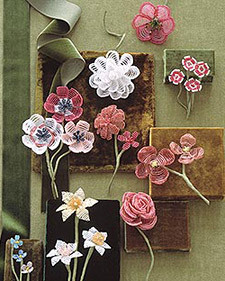 You can use them for corsages, hair accessories, boutonnieres, and whatever else you dream up. The beaded blossoms will make beautiful gifts, not only for the members of your wedding party, but for the generations to come. Some brides pass down their dresses; you can pass down your handmade bouquet. A single technique is used to create every one of these flowers. The number of beads per petal, the number of petals, and the way you shape those petals -- rolling, bending, or cupping -- will be different for each flower. Refer to our flower formulas for exact amounts. We used tiny round seed beads. Two-cut or three-cut faceted beads are particularly shimmery, as are color-lined seed beads. You can also use bugle beads, which are straight-cut tubes. It's easiest to buy beads in hanks and thread the 30-gauge galvanized wire through them while they're still on the string. Cut one piece of wire for each petal (about 1 foot for the smallest petals and 1 yard for larger petals). String beads for first two rows onto wire, and center them. Send one end of the wire around and back through only the beads for the second row; pull taut. Continue adding beads and threading both ends of wire through each row. After last row, twist wire ends together. All the stamens for one flower are threaded onto a single piece of wire (1 yard). Thread wire through beads for the base of the first stamen, and slide beads to about 5 inches from the other end. Add beads for loop, then send wire back through beads of the base; pull taut. Continue, adding stamens. After last stamen, twist wire ends together. Start wrapping green floral tape around the stamen wires. Add petals, one at a time, wrapping stem with tape as you go. Wrap tape down the combined stems to the desired length, then trim. Shape petals with your fingers. To make a bouquet, wrap the stems of several flowers together with floral tape. Don't be daunted by all the numbers! Beading flowers isn't hard. Just follow along, taking your time and improvising as you wish. Here are the numbers of rows and beads needed to make the petals and stamens of the flowers shown on the previous pages; use the colors we show there, or choose your own. Then follow our basic beading directions, outlined above.